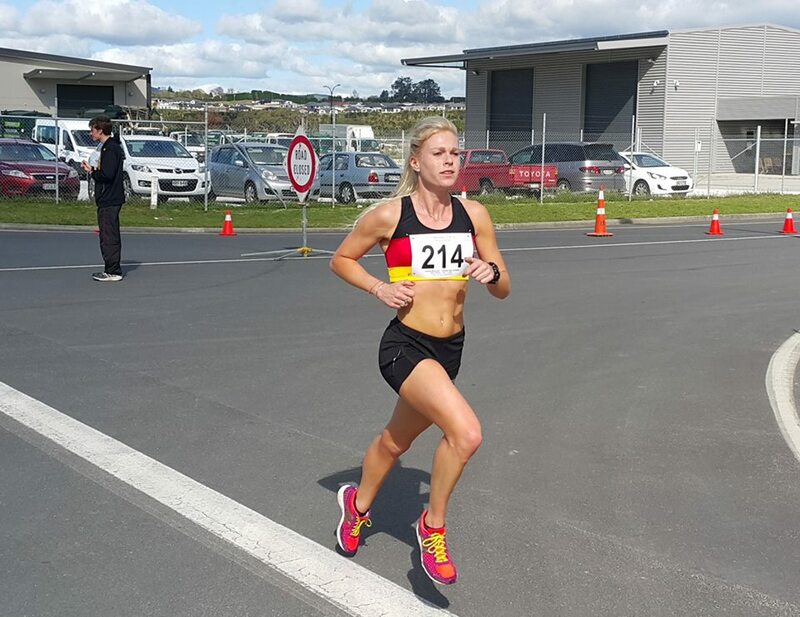 The Athletics New Zealand Road Champs were held on the Tauriko industrial estate circuit Tauranga on Saturday in brilliantly fine weather. The smooth tarmac surface provided fast running. A number of club athletes took part and produced classy results, scored medals and made the medal dais and ran PBs. Four won gold and so make the club honours board. Camille Buscomb was brilliant – she won her third consecutive national senior road title and recorded a PB of 33.55. Camille ran a confident race going to the front from the gun and powering away to a lead that increased as the race progressed. It was a wonderful win by 45 seconds and just reward for the hard working Hawk. Other club senior women result were Sarah Murphy,15th in 40.22, and Vicki Wade, 18th in 42.50. Emerson Deverell also won gold after a busy last weekend racing in the Australian cross country champs at Moonee Valley raceway. She improved on her silver won on the same course last year. It was Emerson’s first national title. The youth 5 kms started in a combined race with W20 and Masters Women so that ensured a fast early pace. Emerson ran with the leaders for the first part but always leading her age group. The fast start ensured a determined and well merited win in 18.22. In the second half of the race Hawks club mate Grace Ritchie after a cautious start came powering through the field into second some 11 seconds back in 18.31. Grace deserved her silver with good pace judgement. It was exciting to see Hawks take the first two places and even better to witness Gina Butler clocking 5th spot in 19.04 with her best run this winter. With 3 athletes in the top 5 a certain team gold was not possible as WBOP did not field a 4th runner which was a shame. Isaiah Priddey picked up a bronze medal with a gutsy run in the Youth 6km just holding out Theo Quax in a desperate sprint down the finish straight. Isaiah clocked 19.40 while Theo was close behind with 19.44. Tristram Connor was 14th with 20.49. The third Hawks gold medal was won by Steve Rees-Jones in the Master Men’s 10km. Steve injury free at last was all class and set a fast pace from the gun and always led. His lead increased with each lap and an attack of stitch during lap 3 gave him the buffer to cruise and then recover to power away on the last lap to score an impressive win in 32.49 a full minute clear of second. Steve scored three medals a gold for winning overall a gold for being 1st MM35-39 and a silver for being in the second team. Mark Scott was 9th in the MM45 with 36.51. Auckland champion and Hawks past president Simon Yarrow sends his best wishes to the club and he was 4th in Steves grade with 34.48. Kevin Knowles was 5th in MM55 with 39.05. In the Masters Womens 5km Maureen Leonard took out gold in winning the 55 grade with a pleasing time of 19.58. WBOP runners took the first two placings in the M20 race over 8kms. Michael Voss after a cautious first 3 laps made a break and won in 26.07 but Hawks’ Harry Ewing who had led the front bunch for the early part hung on well and had to produce an 800 metres type sprint to hold off Marcus Karamanolis Wellington by a mere second 26.16. to 26.17 to win silver. Matthew Scott was 11th in 28.09. 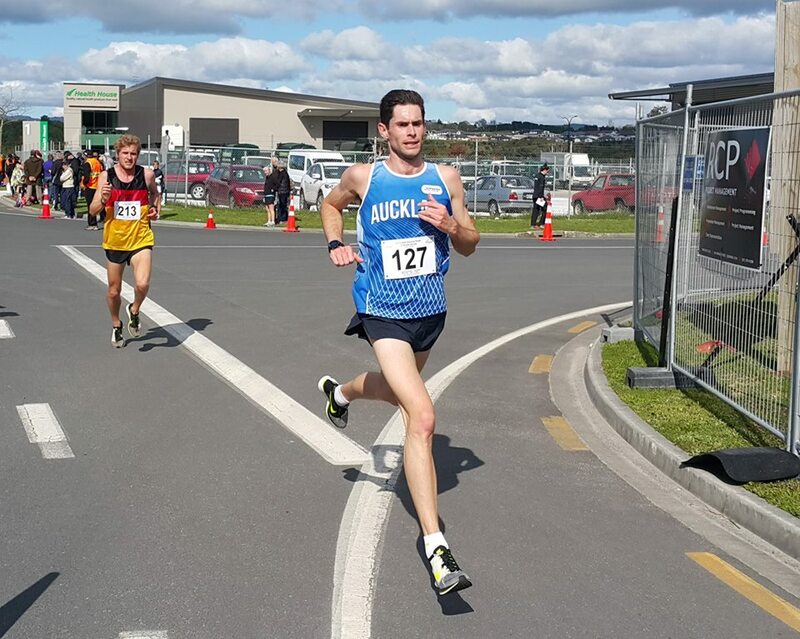 The senior men’s title was retained by Auckland’s Malcolm Hicks who had to work hard to hold off WBOP Aaron Pulford 30.41 to 30.50. In the girls U15 race over 3km Charli Miller ran a quick 9.59 to take a silver with Samantha Corbett 5th in 10.58. In the boys U15 over 3km Lochie Montgomrie was 4th in 10.06 just 5 seconds off scoring a bronze. In a very small field the Wetzel brothers were first (Mathjis 6.37) and third (Tobias 7.21). When a national champs is held on our home patch I was saddened by the small entry from all WBOP clubs. 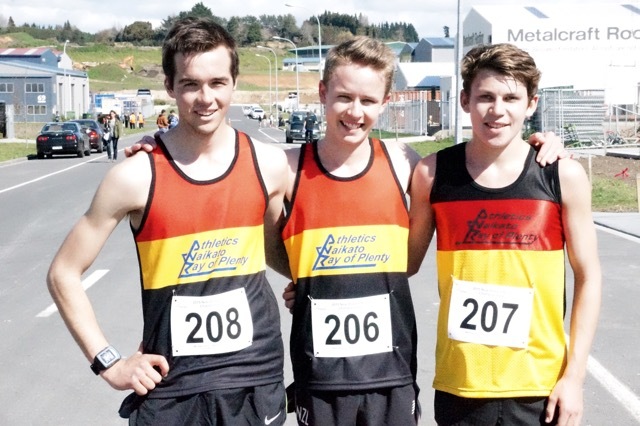 In other news, the AIMS GAMES were held at Tauranga last week with the cross country on Sunday at Waipuna Park. At a quick glance Charli Miller (Fairfield Intermediate) picked up a second in her grade. A huge field took part, with 130 + in each race.